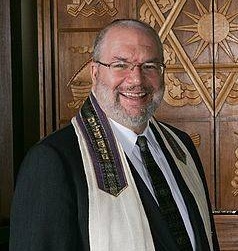 Rabbi Howard L. Jaffe was ordained by the Hebrew Union College- Jewish Institute of Religion in 1983, and has been the Senior Rabbi of Temple Isaiah of Lexington since August of 2000. Previously, he was the rabbi of Temple Har Shalom in Warren, New Jersey, and Associate Rabbi of Temple Israel, Minneapolis, Minnesota. Rabbi Jaffe's early involvement in the youth group of his local synagogue ignited his passion for sharing the meaning and values of Judaism. During his college and rabbinical school years, he directed the youth programs of several different synagogues, as well as the New York City region of NFTY (the North American Federation of Temple Youth). His many years as a staff member of Reform movement camps are echoed in his continued service as a camp rabbi at the URJ Eisner Camp, where he spends a portion of each summer. Throughout his rabbinic career, Rabbi Jaffe has served on the boards of a variety of community organizations, including the Joint Religious Legislative Coalition of Minnesota, the Twin Cities Human Rights Coalition, and the Somerset County (NJ) Council on Alcoholism and Drug Abuse. He served for two terms as president of the Minnesota Rabbinical Association, and is the immediate past co-chair of the Lexington Interfaith Clergy Association, as well as the immediate past chair of the Boston Area Association of Reform Rabbis. During his years in Minnesota, he served on the faculty of Macalester College and the University of St. Thomas, and was a guest lecturer to the student bodies of St. John Vianney (preparatory) Seminary and the St. Paul Seminary. Much of Rabbi Jaffe's efforts beyond the synagogue have been directed to the work of the Reform movement. He has been a member of the board and of the executive committee of ARZA (Association of Reform Zionists of America), is currently vice-chair of the Reform Movement's Commission on Outreach and Synagogue Community, and served as co-chair of the planning committee of the symposium celebrating the twentieth anniversary of Reform Jewish Outreach. Rabbi Jaffe is a past-president of the New Jersey Association of Reform Rabbis, and a former board member of the Central Conference of American rabbis. Rabbi Jaffe has a single mission: to continue to build a vibrant, dynamic Jewish community dedicated to the values and traditions of Judaism and the Jewish people. I view the rabbinate as a remarkable opportunity to make a meaningful difference in the world in three divergent, yet interconnected, ways. First and foremost is the personal connection that a rabbi makes with others. As a rabbi, I am privileged to share deeply in the most powerful moments in people's lives. Every life cycle event brings the possibility of achieving a sense of the holy, as well as creating a bond to Jewish life, to the synagogue, and to me as the representative of both of the above. Done properly, life cycle events have the capacity to be transformational, having an impact that extends far beyond the event itself. Counseling sessions are one of the most meaningful ways we have of conveying the depth of the wisdom of our tradition and the values for which we stand in a deeply personal fashion, and I find that I am called upon regularly by members of my congregation in this regard. In addition, in an age when we are constantly told that the Jewish community is facing an uncertain future, it is essential that I make myself available to those who are not yet members of the congregation, even as I, of course, always place top priority on those who are members and on the needs of the congregation itself. There is no question in my mind that a positive interaction with a rabbi, whether it is by officiation at a baby-naming or by personal counseling, can go a long way towards drawing someone closer to the life of the synagogue. Of course, the most important and most potent text that any rabbi can teach is the way s/he conducts him/herself. I am acutely aware that by accepting the title rabbi, and even more, the leadership of a congregation, the words I speak are not nearly as significant as the way that I conduct myself. As a teacher, which includes being the primary resource for Jewish knowledge in the congregation, I am always aware that the quality of the teaching experience is essential. I include under that heading not only the teaching that I actually do in front of a group of people, but that which takes place in every educational offering of the synagogue, as well as those programs that seek to convey Jewish knowledge and Jewish experience. I see it as my responsibility to strive for all of the educational and programmatic activities of the synagogue being held to as high a standard as is reasonable, by example, by my input and by my availability as a resource and a support. Beyond the synagogue, I believe that it is critical that, as a congregational rabbi, I am involved in the work of the greater Jewish community and the community at large. I firmly believe it is critical that the rabbi, with the support and encouragement of the congregation, participate in those activities and programs that reflect the synagogue's (and the Jewish community's) values, which include building relationships with those groups and institutions that also endeavor to build a better community and society. Finally, I understand the role of the rabbi to be that of the visible and well-differentiated leader of the congregation, who works in committed partnership with the lay leadership of the congregation. One of the great paradoxes of the rabbinate is that the rabbi has, at once, great influence and little authority. While there are surely areas in which the rabbi's voice is given the most weight, and even some few decisions which are left entirely to the rabbi, a healthy environment can exist only when the most significant decisions are arrived at after open and thorough dialogue between the rabbi and the leadership of the congregation. The only effective means for a rabbi to carry out his/her vision for a synagogue is to inspire and enfranchise the congregation's leadership and membership, so that they share in that vision and work together to make it manifest.